When done standard Illumina MP preps, reverse complemented with fastx-toolkit and aligned with standard parameters using bwa/bowtie. A “paired-end” or “mate-pair” read consists of pair of mates, called mate 1 and mate 2. Pairs come with a prior expectation about (a) the relative orientation of the mates, and (b) the distance separating them on the original DNA molecule. Exactly what expectations hold for a given dataset depends on the lab procedures used to generate the data. 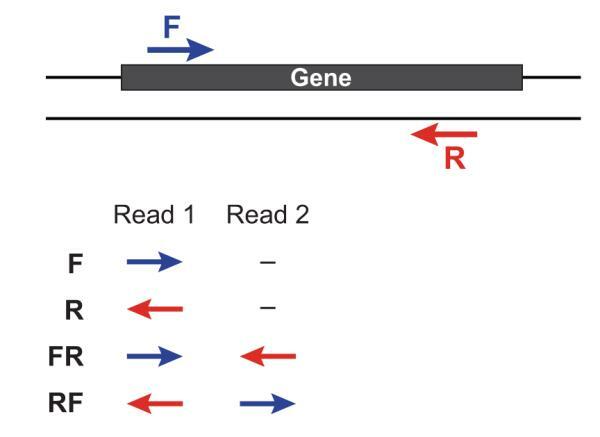 For example, a common lab procedure for producing pairs is Illumina’s Paired-end Sequencing Assay, which yields pairs with a relative orientation of FR (“forward, reverse”) meaning that if mate 1 came from the Watson strand, mate 2 very likely came from the Crick strand and vice versa. Also, this protocol yields pairs where the expected genomic distance from end to end is about 200-500 base pairs. The minimum fragment length for valid paired-end alignments. E.g. if -I 60 is specified and a paired-end alignment consists of two 20-bp alignments in the appropriate orientation with a 20-bp gap between them, that alignment is considered valid (as long as -X is also satisfied). A 19-bp gap would not be valid in that case. If trimming options -3 or -5 are also used, the -I constraint is applied with respect to the untrimmed mates. The larger the difference between -I and -X, the slower Bowtie 2 will run. This is because larger differences bewteen -I and -X require that Bowtie 2 scan a larger window to determine if a concordant alignment exists. For typical fragment length ranges (200 to 400 nucleotides), Bowtie 2 is very efficient. The upstream/downstream mate orientations for a valid paired-end alignment against the forward reference strand. E.g., if —fr is specified and there is a candidate paired-end alignment where mate 1 appears upstream of the reverse complement of mate 2 and the fragment length constraints (-I and -X) are met, that alignment is valid. Also, if mate 2 appears upstream of the reverse complement of mate 1 and all other constraints are met, that too is valid. —rf likewise requires that an upstream mate1 be reverse-complemented and a downstream mate2 be forward-oriented. —ff requires both an upstream mate 1 and a downstream mate 2 to be forward-oriented. Default: —fr (appropriate for Illumina’s Paired-end Sequencing Assay).